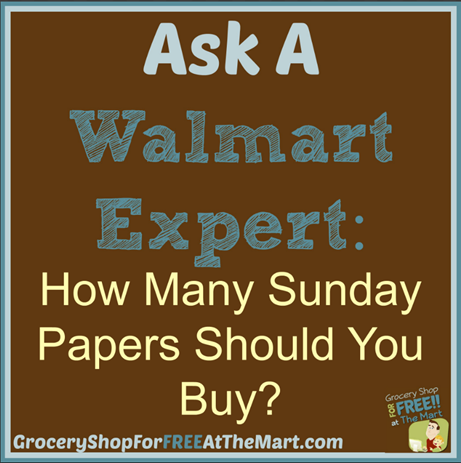 Ask a Walmart Expert: How Many Sunday Papers Should You Buy? Short Answer? As many as you need. This one is a little tricky because it varies from household to household. There are 3 big limiting factors when deciding how many papers to buy each week; cost, need, and available deals. How Much Do Your Papers Cost? When I first started couponing I really didn’t know what I was doing so I just picked up my Sunday paper every week and paid full price which at that time was (I believe) $2.50 for the Fort Worth Star Telegram. Then I saw you could get a bundle of 2 for $4 and I thought I was doing good. Now I know I was WAYYYY overpaying. You can find Sunday papers for $1 at most dollar stores on Sunday morning. Some markets have started putting the Sunday coupons in the Saturday paper at no additional cost. The point is if your papers are expensive, you may not want to buy very many. In fact, what most people do on week where there aren’t very many good coupons is to just order the coupons you need from a clipping service like Klip2Save. It’s a heckuva lot better to pay 8 cents each for 10 copies of the one coupon you need then to buy a bunch of papers at up to $2.50 a pop. How Many Papers Do You Need? Another factor to determine how many papers you should buy I to figure out how much you need to buy for your family. When I had all 4 kids living at home and was trying to keep a family of 6 plus all their friends (It seemed) fed, I bought 20 or more papers a week. Now that I’m down to last one still living with us, I buy 10 but could probably get away with 5 just fine. You just need to gauge the size of your family and balance that against the cost of papers and come up with a number you can live with. What Are the Deals This Week? The final thing you need to look at is to see if there are any hot deals in this week’s paper. Every week around Wednesday or so, I’ll put up a Coupon Preview list that will not only list all the coupons this week, I’ll also try to look through the coupons and point out any deals I think look especially exciting. A good FREEbie or Money Maker can mean that you are losing money by not buying as many papers as you can get your hands on. Take all these factors together, mash them around in your head and pick a number that works for you. Then don’t be afraid to adjust it week to week depending on what’s available. Did that help? Leave a comment and let me know! When do the new sunday papers come in for walmart? Im starting to coupon and i just got two sunday papers but already expired deals so i would like to know whens the best day to get the paper! Thanks! It depends on your area. We get ours on Saturday. Maybe ask your store or newspaper. You need to check your local stores and see what they sell when. Also, check your dollar stores to see if they have deals. This might help.